Our three year old daughter Liz was in the backseat of the car while my wife was driving. Mom made a wrong turn. That made my wife crack-up. But while Mom was laughing out loud, Liz didn’t see the humor. “That’s what the GPS always says when you make a wrong turn,” Liz said. Which is true, and explains why for Liz there is a natural correlation between “wrong turn” and “recalculating,” because throughout the entire three years of her life she’s been hearing the GPS say “recalculating” when Mom or Dad make a wrong turn. She has never lived in a world without the GPS acting as our personal on-board navigator, ready to “recalculate” at a moment’s notice, and for her it’s a commonplace, a given. But to us, her parents, it’s funny because for us the GPS is still novel and we don’t have a natural association between “wrong turn” and “recalculating”. In our minds the GPS retains its mystique as a marvel of modern engineering, and “recalculating” is still something vaguely amazing and unexpected, especially when coming from our three year old daughter. It reminded me of one of our friends in Minnesota who grew up in Seattle, but has raised all her kids in Minnesota. A few years back we had an unexpectedly mild winter, coupled with a late and long Lent, which meant that birds were chirping and flowers poking through black earth when Easter rolled around. Our friend took this for granted, but her kids were floored. “Can you believe it?” her kids asked. “We’ll be hunting Easer eggs in grass instead of snow! I’ll bet we’ll find them all this year!” (When you hide Easter eggs in snow, you can expect to still be finding some well into Ordinary Time). In our friends mind, it was strange every year to pull on gloves and boots to hunt for Easter eggs, but for her kids it was green grass at Easter that was exotic. Perceptions and assumptions change over time. The Gauls went to sleep one night thinking they were still speaking Latin, and that they’d been speaking Latin continuously in the hundreds of years since the withdrawal of Roman troops, only to wake up one morning and be greeted by Irish missionaries who informed them that the language they spoke had long since transformed itself from Latin into something new. The same thing happened in Spain, and even in Italy itself, giving rise to three new languages that were each mutually unintelligible. The Gauls called their new language French and immediately set about trying to ban McDonald’s. It’s the reality of these kinds of changes, little in themselves but massive in accumulation, that makes it interesting to read the annual “Mindset List” from Beloit College. It’s a quick gauge for tracking some of the evolving inter-generational changes in perspective in our own era. The “Mindset List” says things like: ‘For the incoming freshmen the phrase “sounds like a broken record” carries no first-hand experience, since they have never seen a record player or heard a broken record.’ I was floored to read an item on a list a few years ago that said something to the effect of: ‘The incoming freshmen were never alive during The Cold War, they were born after The Berlin Wall came down, and the Soviet Union has never existed during their lifetime.’ It was strange to realize that such a central, defining feature of the world during most of my lifetime was for them ancient history, and probably seemed slightly unreal, with little relevance to their own lives. Just like it some of Grandma’s stories used to seem to me when she’d tell me about life during World War II. I’ve come to realize that my lack of appreciation for her reminisces was my loss, as the people like my grandmother, and Blessed John Paul the Great, and Pope Benedict XVI, who lived through those terrible times have much to teach us, and it’s never long before the last generation’s experience passes beyond our reach forever. G. K. Chesterton advised the antidote of “the democracy of the dead” – looking to tradition, to those who have gone before us, to gain different perspectives on life and ultimate reality. C. S. Lewis advised the same thing, recommending that for every modern book you read, you should also read one old book. It was a way, Lewis said, “to keep the clean sea breeze of the centuries blowing through our minds,” sweeping away some of the assumptions of the current age that tend to settle thick on our thoughts – or at least helping us to start recognizing where some of those assumptions cloud our perceptions. Every age has its own outlook. It is specially good at seeing certain truths and specially liable to make certain mistakes. We all, therefore, need the books that will correct the characteristic mistakes of our own period. And that means the old books. All contemporary writers share to some extent the contemporary outlook — even those, like myself, who seem most opposed to it. Nothing strikes me more when I read the controversies of past ages than the fact that both sides were usually assuming without question a good deal which we should now absolutely deny. They thought that they were as completely opposed as two sides could be, but in fact they were all the time secretly united — united with each other and against earlier and later ages — by a great mass of common assumptions. John Henry Newman to me is very helpful here. He talks about the development of doctrine. Newman says, look, ideas exist not on the printed page. Ideas exist in the play of lively minds. If I take in an idea, I analyze it, I judge it, I compare it, I contrast it, I turn it around. I then throw it to somebody else. They do the same thing. They toss it back to me, it’s in this lively play that the full panoply of the idea unfolds. Newman said, a real idea is equivalent to the sum total of its possible aspects. Only when I’ve seen all the different angles and profiles of an idea do I really understand it. Think of it in terms of a physical object. Like St. Peter’s Basilica. Now, I’ve seen St. Peter’s up close. It looks a certain way. I’ve seen it from all the way across the city of Rome. I’ve seen it even from an airplane. I’ve seen it from the Janiculum Hill. In each perspective it looks different, a different aspect appears. And it often seems that St. Michael must go it alone these days. It was not always so. 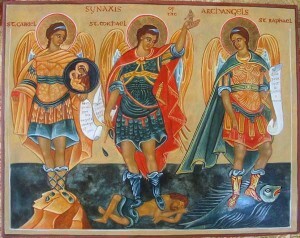 Great saints like Francis of Assisi made it a point to keep company with St. Michael. St. Francis of Assisi went on pilgrimage to Mount Gargano, a site in Italy where St. Michael appeared. St. Francis prayed outside the cave of Michael’s appearance, but would not enter. He deemed himself too unworthy. The shrine, which is still located at Mount Gargano, is one of only two basilicas in all the Church not dedicated by a Bishop, as it was consecrated by the presence of St. Michael (the other is the Church of the Nativity in the Holy Land, consecrated by Christ’s presence). St. Francis celebrated Michaelmas every year and practiced a St. Michael’s lent for 40 days before Michaelmas. In fact, St. Francis had fasted and prayed for 40 days in honor of St. Michael before he received the stigmata. Padre Pio also encouraged pilgrimage to Mount Gargano and dedication to St. Michael. Mont Saint Michel, a great medieval monastery located on a tidal island off the coast of Normandy and the site of Chesterton’s St. Michael in the Lepanto poem, was another place St. Michael appeared and a great center of pilgrimage in the middle ages. Charlemagne dedicated his kingdom to St. Michael at Mont Saint Michel. There was also national devotion to St. Michael in England, where in 1114 King Ethelred declared three days of national fast prior to Michaelmas. Other pilgrimage sites to Saint Michael included St. Michael’s Mount, an island off the coast of Cornwall where St. Michael appeared, Castel Sant’Angelo in Rome where St. Michael appeared and ended a plague, and in places like the Michaelion (now destroyed) which was in present day Istanbul (and where St. Michael appeared to Emperor Constantine). Saint Michael has also appeared in other places around the world outside of Europe, such as San Miguel del Milagro in Tlaxcala, Mexico. One tradition holds that Saint Michael aided Saint Patrick in driving the snakes out of Ireland, appearing on Skellig Michael, a rocky islet off the coast of Ireland, to assist St. Patrick. St. Michael helped Saint Joan of Arc in her mission. In 1696 St. Michael appeared at Bar Convent in the British city of York, where he drove away a mob that was attacking the hidden church there (the church was hidden since it was illegal to practice Catholicism in England at that time). Pope Leo XIII composed a prayer to St. Michael invoking his aid to defend the Church against the attacks that the Pope foresaw would be directed against it. Blessed John Henry Newman composed verse in honor of St. Michael. St. Francis de Sales recommended veneration of St. Michael. And there are many more, great saints and holy people throughout the ages that drew much from their devotions to St. Michael. For those of us new to his veneration, there are many ways to begin St. Michael devotions. There is the St. Michael Chaplet (and you can get a CD or DVD of Mother Angelica reciting the Chaplet to help you get started, plus a set of St. Michael Chaplet beads and small, inexpensive pamphlet with all the Chaplet prayers and beautiful images). There are many books about St. Michael, including an informative and low-cost little booklet which is a quick read and makes a good introduction, and which has many prayers, among them the Chaplet and a litany. There are also several litanies on-line, such as this Litany of Saint Michael the Archangel. And there are different novenas to St. Michael, like this Novena to Saint Michael (and you can say any prayer for nine consecutive days for a novena, including the famous St. Michael prayer composed by Pope Leo XIII). There is poetry honoring Saint Michael, such as Blessed John Henry Newman’s St. Michael, on-line here, or James Russell Lowell’s St. Michael the Weigher, also available on-line. You can make special foods to honor St. Michael’s feast day, read the Divine Office on St. Michael’s feast day (and www.divineoffice.org includes songs and audio of the readings, it’s a great way to pray with the Church). A devotion I’ve seen in our area that I always love is to visit a statue of a saint on his or her feast day, and bring something like flowers, a candle, prayer cards, or prayer beads, to place at the statue, and pray there to the saint. And of course one of the best things you can do is attend mass on St. Michael’s feast day — and maybe you’ll even be lucky enough to have a church dedicated to St. Michael the Archangel you can visit for his feast day mass. If Saint Michael is a little lonely these days, there’s no reason for it, and the neglect is our loss. There are many devotions available to us to keep company with this great helper, who has been called “The First Christian” and “The First Apostle,” and whose desire is to bring us to Christ. His aid is available to us, we only need to ask. And St. Michael is only one of the three great Archangels honored on September 29 — there are great devotions to the archangels Gabriel and Raphael also! We just need to get started. If we can make some time for St. Michael and the other archangels, we can begin to explore another aspect of our faith, another way to come closer to Christ, and progress further on our own journey. Next Article Will New Saint Bring New Allies to UN Abortion Debates?